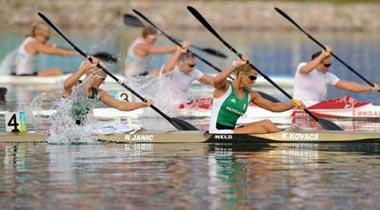 BEIJING, Aug. 23 (Xinhua) -- Hungary's Katalin Kovacs and Natasa Janic retained the Olympic title in the women's kayak double 500 meters at the Shunyi Olympic Rowing-Canoeing Park here on Saturday. Shunyi Rowing-Canoeing Park in Beijing, China, Aug. 23, 2008. The duo, who took world titles in 2005 and 2006, finished in one minute 41.308 seconds, 0.784 seconds ahead of Beata Mikolajczyk and Aneta Konieczna of Poland. Marie Delattre and Anne-Laure Viard of France took bronze in 1:42.128. Reigning world champions Fanny Fischer and Nicole Reinhardt of Germany finished in fourth place. 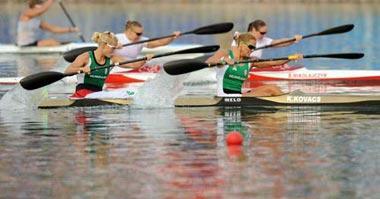 They won the gold medal in the women's K4 500m on Friday.